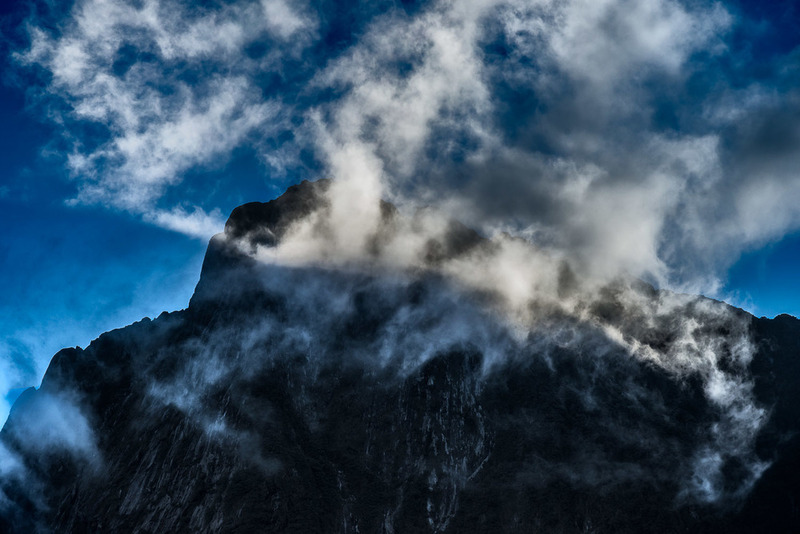 A spectacular scene as light illuminates clouds in front of a mountain top above Milford Sound, New Zealand. Light is at the heart of all great photos. In the landscape light is influenced by weather and Milford Sound in New Zealand is a place that gets a great deal of weather. More often than not that means rain. But either side of a rain shower clouds are likely to drift across the mountain peaks surrounding Milford Sound. I first travelled to Milford Sound on the South island of New Zealand around 25 years ago. Actually, I didn't make it. After the long drive from Christchurch I found my way into Milford Sound blocked by a collapsed tunnel. Apparently some poor soul had lost their life during the collapse and, with the way blocked, traffic was being turned around. As this was the only road into the sound I had no choice but to turn around and make my way back to Christchurch. I remember deciding to make the trip as a big semi circle that took me through Queenstown. I didn’t have time to stop in Queenstown, but I remember being struck by the sheer beauty of the town and the surrounding landscape. I decided that, next time, I'd make a point of spending a few days in the area. I finally made it back to Queenstown in mid 2012. It's a lovely place with great opportunities for landscape photography. If the chance to make a home there came my way I'd likely jump at it. The highlights from that trip were Lake Hayes, Arrowtown, Paradise and Wanaka. And, to my great satisfaction, I was able to make a quick dash back down to Milford Sound where I was fortunate indeed to experience clear weather for both sunset and sunrise photography sessions. As an extra treat I had an early morning helicopter flight prior to heading out on a spectacular cruise of Milford Sound. I also got to meet my friend Trey Ratcliff on location at sunrise and sunset and, in between, for an evening chat in the bar. A pretty perfect day and a half I'm sure you'll agree. The photo at the top of this post was made on a cruise boat as it sailed the sound. The way the light illuminated the clouds and divided the image, diagonally, from top to bottom was wonderful to behold. The notion as above, so below has long interested me and it's what I thought of while composing this image. I'd certainly recommend a trip to New Zealand for keen landscape photographers. The infrastructure is good, the people are friendly and the scenery is truly spectacular. I’m very much looking forward to my next visit.